314th day of the year. There were then 51 days left in 2018.
on the 45th week of 2018 (using US standard week number calculation). 50th day of Fall. There were 41 days left till Winter. 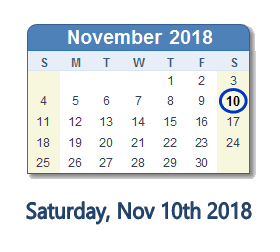 What happened on November 10th 2018? Trump Threatens to Withhold Federal Payments to California, Claiming its Forest Management is "Poor"